PXG has expanded its interest in elite players to include top student-athletes and coaches at six NCAA D1 universities. By providing tour-level fittings and golf equipment, PXG will support talented collegiate golfers in their pursuit of excellence. 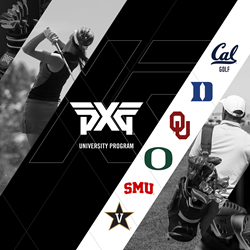 Cal Golf, Duke University, The University of Oklahoma, The University of Oregon, Southern Methodist University and Vanderbilt University are among the programs that have penned deals with PXG thus far. The relationship provides equal support to both the men’s and women’s golf teams and allows for up to 10 full sets of golf clubs to be custom fitted for each. The addition of a University Program is a natural next step in the evolution of PXG, which has experienced explosive growth since introducing its groundbreaking technology just a few years ago. With a current roster of 18 tour professionals, the PXG University Program further solidifies the company’s commitment to support players at all levels. “PXG is proud to support the future of the game with the best performing equipment in the industry,” Parsons added. To learn more about PXG golf equipment or the University Program, visit http://www.PXG.com. Parsons Xtreme Golf (PXG) is based in Scottsdale, Arizona. The company was founded by GoDaddy founder, businessman and philanthropist Bob Parsons in 2014. Leveraging breakthrough technology and sophisticated manufacturing processes that integrate high-performance alloys, PXG produces the finest golf clubs in the world. The company has more than 125 global patents issued for its proprietary designs.